Whether you’re a contractor sourcing professional business supplies, or a home-owner starting a DIY project, our specialists will have the materials and advice you need, right on your doorstep. GS Gordon is a building supplies and haulage company based in Lisburn, Northern Ireland. Operating as a family business since 1988, we have been servicing happy customers across the country for almost three decades. We supply building materials and haulage vehicles for both private and commercial projects; from DIY enthusiasts to constructions contractors, landscapers and everyone in between. We have worked with businesses of all sizes and individuals, too. With the ability to both deliver and collect building supplies, we pride ourselves on sourcing the highest quality local materials. Our plastering and paving sand hails from the Sperrin Mountains, while our grey County Down stone is also highly regarded in the industry. 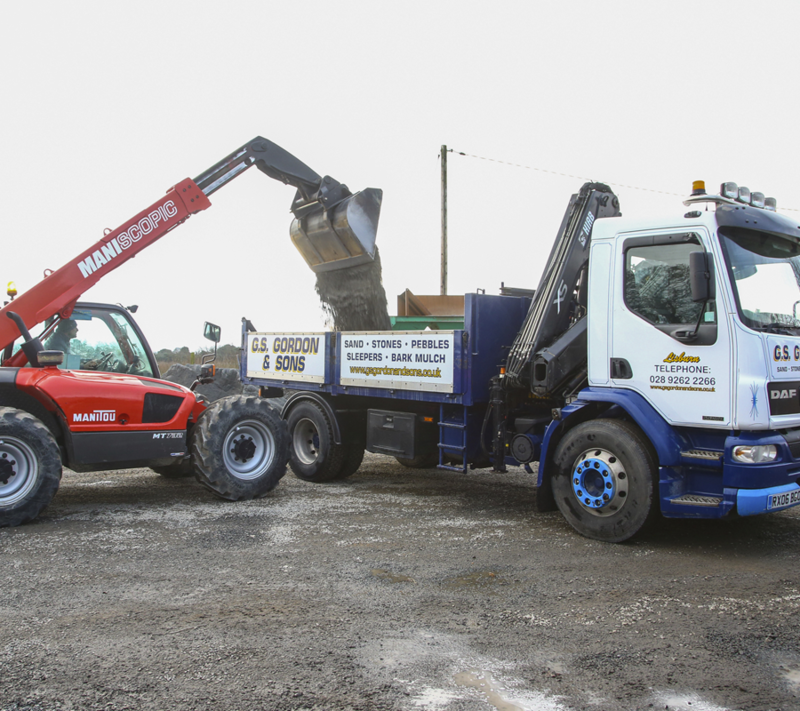 At GS Gordon we have a team of skilled drivers who manoeuvre – among other vehicles – our speciality 4×2 18 tonne truck and our crane truck, both of which help with accessibility on larger sites. Our tonne bag deliveries are another unique option that make your build run more smoothly. For smaller projects, such as home driveways, no digger is required as our expert team deliver and spread stones directly onto the space. With a breadth of experience in the industry, our team are happy to advise you on any aspect of materials, transporting, loading or offloading that you may be worried about undertaking yourself. We understand the challenges in the trade and so we try wherever possible to work within short and changing delivery times, as well as offering Saturday morning delivery options. We can take payments by phone and by card, and place a high priority on our customer service, working with hundreds of regular, happy customers across Northern Ireland. When you need the best materials and haulage, at the most efficient price, with a quality customer service approach, contact GS Gordon today.